Gorgeous, double white, bowl-shaped flowers from January to February (occasionally earlier) and clumps of leathery, dark green leaves. 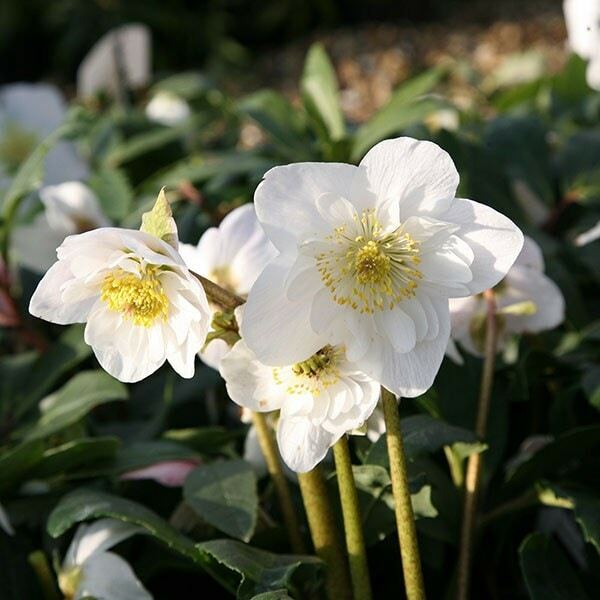 This pretty Christmas rose looks great planted in bold groups towards the front of a partially shady mixed border. Although it prefers a heavy, neutral to alkaline soil, once established it will tolerate drier conditions. Hello, As these come in pots, they can be planted at any time of the year. Spring or Autumn are the ideal times, but Summer planting can be undertaken if the plants are kept well-watered, and in Winter if the soil is not frozen. They will grow to around 30cm tall and once established, they can flower over a 6 to 8 week period in January and February.